Back to the Print Table. It has been such a pleasure to be back at the print table. While I had been teaching for so many years, finding time for creating work had been at a premium. I now find that with the establishment of the Sunshine Print Artspace I can actually start screen printing again. Setting up a screen print studio is no mean feat. Firstly, you need lots of room especially if you are interested in printing lengths of fabric. Then you need all the rest of the equipment like exposure units, wash troughs, light boxes, ink mixing benches and if you have concerns about water and waste you need to install all your filtrations systems. Not necessarily suitable for a domestic studio. It’s surprising how quickly I found myself returning to the rhythm of the squeegee pull. Now for a collection of recycled cotton scarves and the ever useful tea towel. It’s always exciting to work to a brief and to have a project. I have spent the past few weeks researching my topic. While I have usually had a natural leaning to painting and drawing florals I was asked to design a range featuring chickens. They are such a delight to watch and fortunately my brother has hens. So after numerous, photos and sketches here is my collection which are available on various products through Redbubble. A great way to get your work noticed is to enter design competitions, of which there are loads. I recently participated in an Instagram challenge to create a floral a day for 30 days which was posted by Print Fresh a Philadelphia based design studio. I was only able submit 6 designs because I started late and I work full time, so weekends are my painting time. I had loads of fun and thoroughly enjoyed creating the florals and seeing all the work of other participants. I would have loved to have been doing it everyday for the 30 days. There are many arguments for and against entering these design competitions, this one written by Neil Bennett for DigitalArts for example and its worth finding out what designers think. I enter because it’s an opportunity for me to take on a design brief – to challenge myself and my ability to meet a brief, to improve design skills and to do something that may not necessarily be about my own design preferences. Posting publicly also gives me some excellent insight into which designs are popular and I must say I am usually very surprised. Designs that I have spent considerable time on and that I quite like are often the least favourite. So here are some recent posts I made for the Print Fresh Instagram. Which one is your favourite? Enjoy! I am so fortunate to have the opportunity travel. My favourite place is textile heaven – India. Apart from the most extraordinary range of textiles in the world, everything a textile designer could possibly desire is there – India is a visual feast. The colours are mesmerising and full of joy, texture and pattern abound – everything from the architecture to fragments of debris scattered on the street or the remains of posters layers on the walls bordering major roadways, beautifully painted trucks and finely painted henna to celebrate a wedding , huge bundles of flowers at the flower markets ready to be strung together and taken to the temple. I find it so inspiring. The images below were taken in Chennai, Kolkata and Jaipur. At last…. it’s been so long…..
Today I have finally done a workshop on how to use WordPress properly… Phew that took a long time. The workshop was through Creativelive… awesome.. https://www.creativelive.com/ . What great courses they offer. So be prepared world for a whole lotta new things. Have a look at my Rebubble portfolio- you can shop here too. Great thing is, this is a sustainable way of producing textile and other products. Designs are only printed to order, so no speculation production. Use it and keep it forever or until it is totally worn out. Images of printed textiles exhibited at Craft Victoria, Melbourne Victoria, From the two sides to every story collection. Spent the morning digging up weeds and enjoying the winter sunshine. I am a bit excited about being contacted by Printed Village and being one of twelve people selected to be profiled in the Design Community which will be launched in August. So, I thought I would post some of the designs I created for the theme “Tribal”. I love Friday… it is the day I have the time to work at home on design ideas. 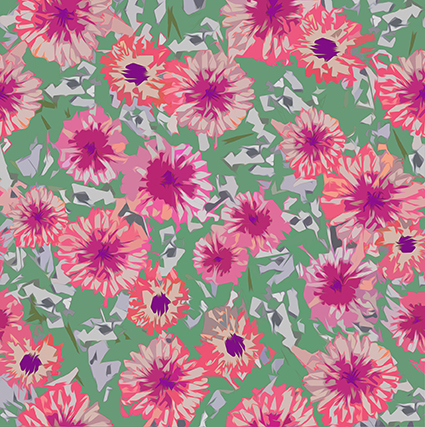 I am currently working on florals for the latest Tigerprint floral wrapping paper competition. You have the chance to upload 5 designs and I had already loaded three last weekend. But, I did this one today and think it’s much better than the last one I posted, which reminds me of wrapping paper suitable for my Grandmother rather than the Target market customer at Marks and Spencers. It is the end of semester andI have to tell the world that I have had such a wonderful time teaching two first year groups drawing and textile design. What a delight – great work, enthusiastic and creative students and 16 weeks of fun. I hope to share some of their designs with you, but will need to get permission first. Today I have been reworking and recolouring some designs for the next Tigerprint contest . The theme is florals – my favourite. So here they are….